Had I been in love, I could not have been more wretchedly blind. 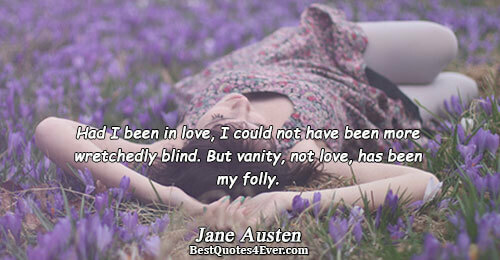 But vanity, not love, has been my folly. Vanity rather than wisdom determines how the world is run. The World will give you hopeless vanity, but what will you give the World? Look. Survey. Inspect. My hair is ruined! I look like a pan of bacon and eggs! I'm so pretty, it's hard for me to think of myself as intelligent. The vanities of life:pleasure, possession, position and power.